Vertical drop is determined by subtracting the base elevation from the highest serviced elevation at each ski resort. While the vertical drop does not determine the acreage or size of a ski resort, the resorts with large vertical drops may have longer or steeper slopes. If a ski resort has a base elevation of 7, 000 feet and a summit elevation of 10, 000 feet, the vertical drop at the resort is 3, 000 feet. Telluride Ski Resort has the greatest vertical drop of all Colorado ski resorts at 4, 425 feet, while Snowmass comes in second at 4, 406 feet. Beaver Creek Resort offers you the third highest vertical drop of 4, 040 feet. Steamboat Ski and Resort lets you experience the fourth highest vertical drop in the state of 3, 668 feet and Aspen Highlands has the fifth greatest vertical drop of 3, 635 feet. Vail Ski Resort features the sixth largest vertical drop in Colorado of 3, 450 feet, while Breckenridge is seventh at 3, 398 feet. Aspen Mountain offers you the eighth largest vertical drop of 3, 267 feet and Keystone Resort has the ninth greatest vertical drop of 3, 128 feet. Crested Butte Mountain Resort provides you with the 10th greatest vertical drop of 3, 062 feet; the lift services up to 2, 775, and a short hike brings you to the summit. 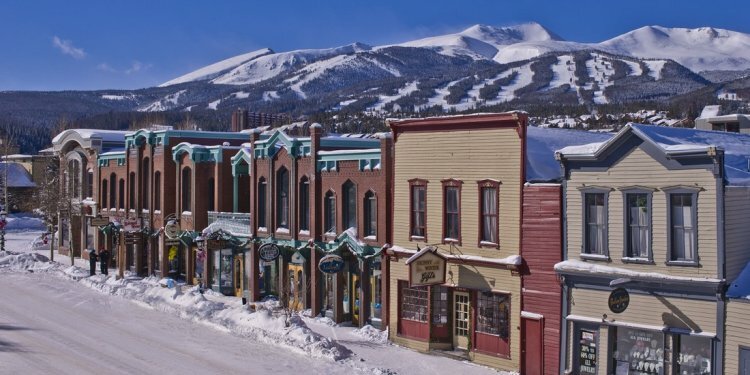 Winter Park Resort offers a vertical drop of 2, 610 feet; Copper Mountain Resort is 2, 601 feet. Arapahoe Basin Ski Area has a vertical drop of 2, 270 feet, while Loveland Ski Area is 2, 210 feet. Buttermilk Ski Resort boasts the 15th greatest vertical lift at 2, 030 feet, and Durango Mountain Resort has a vertical drop of 2, 029 feet. Sunlight Mountain Resort features a vertical drop of 2, 010 feet. Silverton Mountain has a vertical drop of 1, 900 feet, while Powderhorn Resort has a 1, 650-foot vertical drop. Wolf Creek Ski Area has the 20th largest vertical drop in Colorado at 1, 604 feet with Eldora Mountain Resort at 1, 600 feet. Ski Cooper presents a vertical drop of 1, 200 feet and Monarch Ski & Snowboard Area is just under it at 1, 170 feet. SolVista Basin at Granby Ranch offers a vertical drop of 1, 000 feet. Ski Hesperus has the 25th largest vertical drop in Colorado at 700 feet, while Echo Mountain Park is lower with a 600-foot vertical drop. Howelsen Hill Ski Area, at 440 feet, has the smallest vertical drop in the state.